Have you ever encountered a tourist angel? They’re out there. We say you should accept that good things will happen when you travel. It means to look for the positive things that happen when you travel. We have met people who say that Murphy travels with them. You know… the travel version of Murphy’s law…. if something can go wrong when they travel it will. I’m thinking that just sets you up to think negatively…. to look for things that aren’t quite right. That's not how we travel... We always expect things to go well. We think if you expect things to be good and people to be friendly and helpful… that’s what you get. We were driving into Granada, Spain… on a Saturday in May. We try not to drive in big cities, but sometimes our plans just call for it. One wrong turn and we were lost. We were still driving towards “Centro” and following signs towards the Alhambra, but we were clearly not exactly where we wanted to be. Mark was carefully negotiating the roundabouts and watching all the traffic signals when he noticed a fellow following us on a motor scooter. His uniform and badge made Mark nervous that he may have done something wrong…. This very official looking fellow approached the car, and in perfect English told us that he worked for the Visitors Bureau and that we looked lost. If we wanted, we could follow him and he could take us to our hotel. Then he pulled out his cell phone and found us a hotel only a couple of blocks from the old town… with parking… and he had us follow him there. A tourist angel… That’s what I call him. If you are planning on an activity, and it looks like you might not be able to do it… don’t give up. There might be a way to work things out…. 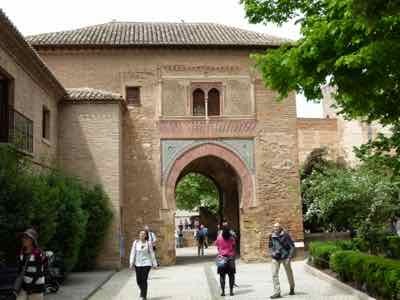 After checking in to our hotel, the hotel staff told us that there were no tickets left to visit the Alhambra for the whole weekend… maybe even for the rest of the month. 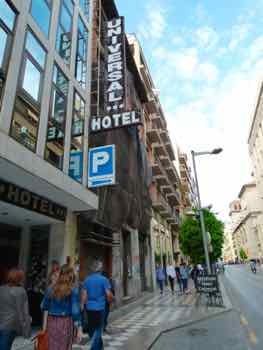 Now, for popular sites like this, any good guidebook will tell you to get advance reservations online. We didn’t… and we often don’t because we don’t have a set itinerary. So what were we to do now? 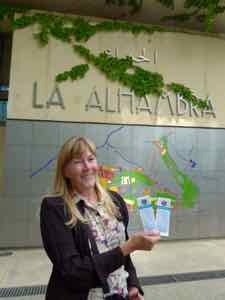 Visiting the Alhambra is the main reason for going to Granada… right? Once again, we expected things to work out. 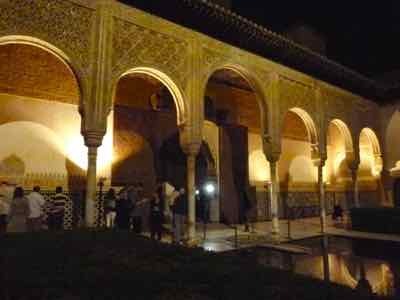 We asked at the Alhambra bookstore, and they told us that there were tickets for a night tour to the palace… not the whole tour, but enough. We had to hike up to the ticket office, and we got tickets… for 10:30 at night! We would never have planned a visit for that late at night, but you know, it was very pretty seeing the carving and arches and fountains at night…. and it was definitely cooler! And we kept saying, if that tourist angel hadn't helped us get a hotel so quickly, none of it might have worked out... but he did find us... and good things happened. 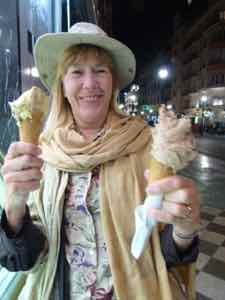 We were so happy on the stroll back to the hotel that we grabbed an ice cream cone. Problems easily solved all day long… travel may keep you on your toes, but it’s just so much fun! And that’s what I’m talking about when I say to expect that good things will happen. That was early in our trip, and somehow it made driving into other cities easier. Even though we didn’t encounter another tourist angel, we did find many friendly and helpful people. Look for the good and the fun and the funny, and more often that not… that’s what you’ll get.